On the 10th of April 2014, at 10:40am local time, Russia's AN-2 airplane intruded from the occupied territory of the Abkhazian region into the airspace controlled by the Georgian central authorities and flew over Georgian MIA posts located in the villages of Shamgona and Khurcha of the Zugdidi district. On the same day, at 12:45pm, the Russian air vehicle again intruded into the airspace controlled by the Georgian central authorities and flew over the villages of Shamgona, Khurcha, Rukhi and Pakhulani, Zugdidi district. 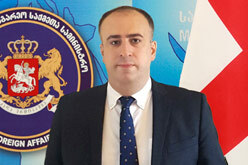 The Georgian Foreign Ministry expresses concern over yet another instance of violation of Georgia's sovereignty and territorial integrity, as well as of the 12 August 2008 ceasefire agreement and calls on the international community, foreign diplomats accredited in Georgia and the EU Monitoring Mission in Georgia to take due action on the aforesaid incidents in order to prevent Russia's provocative activities and attempts to escalate the situation.